Gaucho Snake is the first published project of Gaucho Games. 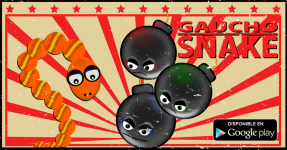 It is an evolution in the concept of the snake where players will have not only to collect apples along the levels, they will have to avoid different kind of bombs and obstacles that make this game exciting. After a whole year of hard work, we are happy to bring the newest version of Gaucho Snake. Even if the concept of this version is similar to the one we introduced on the first version of the game, we have been strongly working on some improvements to the first version. A new GUI was implemented which let us get much more flexibility on graphics and helps to get the best performance regarding to the hardware. For this reason, and in order to end of the year with a better number of users (actually we have more than 1300 downloads in Google Play) we are launching some Christmas graphs that we want to share with the SlideDB community. The latest version of Gaucho Snake has been released on GameJolt, now you can play it on your Android device or directly on your browser!